1.1 What is storm tide? 1.2 What are the disaster potential of Storm Surge? 2 Why do ‘tropical cyclones’ winds rotate counter-clockwise (clockwise) in the Northern (Southern) Hemisphere? 3 Why there are fewer cyclones over the Arabian Sea as compared to the Bay of Bengal? 4 Why there are very few Tropical Cyclones during southwest monsoon season? 5 What are the causes of disaster during cyclone? 5.1 Very heavy rains causing floods. 13 Which sector of the cyclone experiences strongest winds? 14 What is the normal movement of a Tropical Cyclone? 15 What is the role of upper tropospheric westerly trough ? 16 What is 4-stage warning system for Tropical Cyclones? 18 How are Tropical Cyclones monitored by IMD? Storm Surge is an abnormal rise of sea level as the cyclone crosses the coast. Sea water inundates the coastal strip causing loss of life, large scale destruction to property & crop. Increased salinity in the soil over affected area makes the land unfit for agricultural use for two or three seasons. Storm surge depends on intensity of the cyclone (Maximum winds and lowest pressure associated with it and Coastal bathymetry (shallower coastline generates surges of greater heights). The storm tide is the combination of storm surge and the astronomical tide. What are the disaster potential of Storm Surge? Disaster potential due to cyclones is due to high storm surges occurring at the time of landfall. The storm surges are by far the greatest killers in a cyclone. as sea water inundates low lying areas of the coastal regions causing heavy floods, erosion of beaches and embankments, damage to vegetation and reducing soil fertility. Flooding due to storm surges pollute drinking water sources resulting in shortage of drinking water and causing out-break of epidemics, mostly water borne diseases Very strong winds (Gales) may cause uprooting of trees, damage to dwellings, overhead installations, communication lines etc., resulting in loss of life and property. 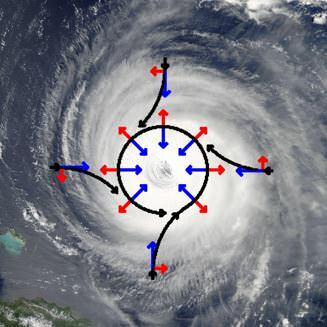 Why do ‘tropical cyclones’ winds rotate counter-clockwise (clockwise) in the Northern (Southern) Hemisphere? As the earth’s rotation sets up an apparent force (called the Coriolis force) that pulls the winds to the right in the Northern Hemisphere (and to the left in the Southern Hemisphere). So, when a low pressure starts to form over north of the equator, the surface winds will flow inward trying to fill in the low and will be deflected to the right and a counter-clockwise rotation will be initiated. The opposite (a deflection to the left and a clockwise rotation) will occur south of the equator. This Coriolis force is too tiny to effect rotation in, for example, water that is going down the drains of sinks and toilets. The rotation in those will be determined by the geometry of the container and the original motion of the water. Thus, one can find both clockwise and counter-clockwise flowing drains no matter what hemisphere you are located. If you don’t believe this, test it out for yourself. 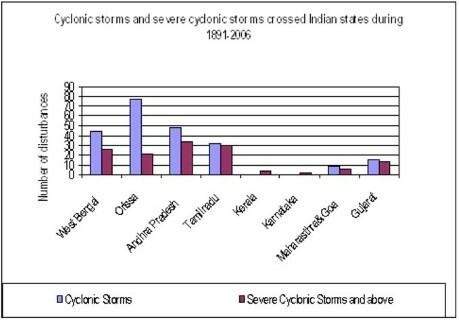 Why there are fewer cyclones over the Arabian Sea as compared to the Bay of Bengal? Cyclones that form over the Bay of Bengal are either those develop insitu over southeast Bay of Bengal and adjoining Andaman Sea or remnants of typhoons over Northwest Pacific and move across south China sea to Indian Seas. As the frequency of typhoons over Northwest Pacific is quite high (about 35 % of the global annual average), the Bay of Bengal also gets its increased quota. The cyclones over the Arabian Sea either originate insitu over southeast Arabian Sea (which includes Lakshadweep area also) or remnants of cyclones from the Bay of Bengal that move across south peninsula. As the majority of Cyclones over the Bay of Bengal weaken over land after landfall, the frequency of migration into Arabian Sea is low. In addition to all the above the Arabian Sea is relatively colder (mosnsoon winds) than Bay of Bengal and hence inhibits the formation and intensification of the system. Why there are very few Tropical Cyclones during southwest monsoon season? The southwest monsoon is characterized by the presence of strong westerly winds in the lower troposphere (below 5 km) and very strong easterly winds in the upper troposphere (above 9 km). This results in large vertical wind shear. Strong vertical wind shear inhibits cyclone development. Also the potential zone for the development of cyclones shifts to North Bay of Bengal during southwest monsoon season. During this season, the low pressure system upto the intensity of depressions form along the monsoon trough (ITCZ), which extends from northwest India to the north Bay of Bengal. The Depression forming over this area crosses Orissa – West Bengal coast in a day or two. These systems have shorter oceanic stay (they make landfall very quickly) which is also one of the reasons for their non-intensification into intense cyclones. What are the causes of disaster during cyclone? The dangers associated with cyclonic storms are generally three fold. Very heavy rains causing floods. The rainfall associated with a storm vary from storm to storm even with the same intensity. Record rainfall in a cyclonic storm has been as low as trace to as high as 250 cms. It has been found that the intensity of rainfall is about 85 cms/day within a radius of 50 kms and about 35 cms/day between 50 to 100 kms from the centre of the storm. Precipitation of about 50 cm/day is quite common with a C.S. This phenomenal rain can cause flash flood. The strong wind speed associated with a cyclonic storm. (60-90 kmph) can result into some damage to kutcha houses and tree branches likely to break off. Winds of a severe Cyclonic storm (90-120 kmph) can cause uprooting of trees, damage to pucca houses and disruption of communications. The wind associated with a very severe Cyclonic storm and super cyclonic storm can uproot big trees, cause wide spread damages to houses and installations and total disruption of communications. The maximum wind speed associated with a very severe Cyclonic storm that hit Indian coast in the past 100 years was 260 kmph in Oct., 1999 (Paradeep Super cyclone). Storm surge occur in places where a tropical cyclone crosses the coast (makes landfall). The severest destructive feature of a tropical storm is the storm surge popularly called tidal waves. The costal areas are subjected to storm surge and is accentuated if the landfall time coincides with that of high tides. This is again more if the sea bed is shallow. Storm surge as high as 15 to 20 ft. may occur when all the factors contributing to storm surge are maximum. This storm tide inundates low lying coastal areas which has far reaching consequences apart from flooding. The fertility of land is lost due to inundation by saline water for a few years to come. The recent cyclone on east coast of India was called ‘Phailin’. How are the tropical cyclones named across the world? Elaborate. WMO (World meteorological organization) divided the world Oceans into Basins and assigned the responsibility of naming the Cyclones to the respective regional bodies. Each regional body has its own rules in naming cyclones. In most regions pre-determined alphabetic lists of alternating male and female names are used. In the north-west Pacific the majority of names used are not personal names. While there are a few male and female names, majority are names of flowers, animals, birds, trees, foods or descriptive adjectives. The names of cyclones in Indian Seas are not allocated in alphabetical order, but are arranged by the name of the country which contributed the name. It is usual practice for a storm to be named when it reaches tropical storm strength (winds of 34 knots). Worldwide, the knot is used in meteorology, and in maritime and air navigation—for example, a vessel travelling at 1 knot along a meridian travels approximately one minute of geographic latitude in one hour. The Indian Meteorological Department (IMD) which issues cyclone advisors to eight countries has a list of names contributed by each of them. Every time a cyclone occurs, a name is picked in the order of the names that are already submitted. Each country gets a chance to name a cyclone. After all the countries get their turn, the next list of names is followed. Naming them after a person/flower/animal etc. makes it easier for the media to report on tropical cyclones, increases community preparedness, also helps in quick information exchange between faraway stations, ships etc. Arctic or polar cyclones occur in Antarctic regions and can reach up to 1,200 miles wide. They can occur at any time of the year. Polar cyclones can also form quickly (sometimes less than 24 hours), and their direction or movement cannot be predicted. Most frequently, polar cyclones develop above northern Russia and Siberia. India Meteorological Department (IMD) uses a 3 minutes averaging for the sustained wind. Maximum sustained wind is the highest 3 minutes surface wind occurring within the circulation of the system. How are low pressure system classified in India? What are the differences between low, depression and cyclone? The pressure criteria is used, when the system is over land and wind criteria is used, when the system is over the sea. The system is called as low if there is one closed isobar in the interval of 2 hPa. It is called depression, if there are two closed isobars, a deep depression, if there are three closed isobars and cyclonic storm if there are four or more closed isobars. The detailed classification based on wind criteria are given in the Table below. “CDO” is an acronym that stands for “central dense overcast“. This is the cirrus cloud shield that results from the thunderstorms in the eyewall of a tropical cyclone and its rainbands. Before the tropical cyclone reaches very severe cyclonic storm (64 knots,), typically the CDO is uniformly showing the cold cloud tops of the cirrus with no eye apparent. 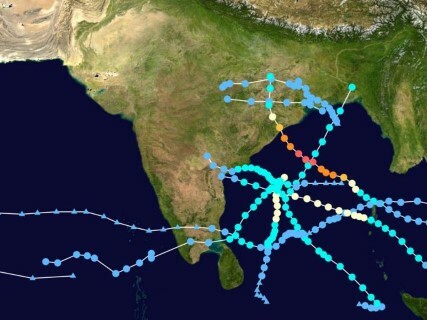 The average annual frequency of tropical cyclones in the north Indian Ocean (Bay of Bengal and Arabian Sea) is about 5 (about 5-6 % of the Global annual average) and about 80 cyclones form around the globe in a year. The frequency is more in the Bay of Bengal than in the Arabian Sea, the ratio being 4:1. Which sector of the cyclone experiences strongest winds? In general, the strongest winds in a cyclone are found on the right side of the storm. The “right side of the storm” is defined with respect to the storm’s motion: if the cyclone is moving to the west, the right side would be to the north of the storm; if the cyclone is moving to the north, the right side would be to the east of the storm, etc. The strongest wind on the right side of the storm is mainly due to the fact that the motion of the cyclone also contributes to its swirling winds. A cyclone with a 145 kmph winds while stationary would have winds up to 160 kmph on the right side and only 130 kmph on the left side if it began moving (any direction) at 16 kmph. What is the normal movement of a Tropical Cyclone? The cyclones, which cross 20° N latitude generally, recurve and they are more destructive. Tropical Cyclones move as a whole. They casually move west-northwestwards or northwestwards in the northern hemisphere. The average speed is 15-20 kmph (360-480 km per day). They may change their direction of movement towards north. During this change their speed of movement decreases to 10 kmph or even less. A larger fraction of such storms later turn towards northeast and move northeastwards very fast at a speed of 25 kmph or more. What is the role of upper tropospheric westerly trough ? An Upper tropospheric westerly trough is important for tropical cyclone forecasting as they can force large amounts of vertical wind shear over tropical disturbances and tropical cyclones which may inhibit their strengthening. There are also suggestions that these troughs can assist tropical cyclone genesis and intensification by providing additional forced ascent near the storm centre and/or by allowing for an efficient outflow channel in the upper troposphere. The location of this trough and its intensity can also influence the movement of the storm and hence can be used for cyclone track forecasting. What is 4-stage warning system for Tropical Cyclones? Issued when a depression forms over the Bay of Bengal irrespective of its distance from the coast and is likely to affect Indian coast in future. The pre-cyclone watch is issued by the name of Director General of Meteorology and is issued at least 72 hours in advance of the commencement of adverse weather. It is issued at least once a day. Issued atleast 48 hours before the commencement of the bad weather when the cyclone is located beyond 500 Km from the coast. It is issued every three hours. It is issued 12 hours before the cyclone landfall, when the cyclone is located within 200 Km from the coast. More accurate & specific information about time /place of landfall and associated bad weather indicated in the bulletin. In addition, the interior distraction is likely to be affected due to the cyclone are warned in this bulletin. Placing a substance on the ocean surface. By cooling the surface waters with deep ocean water. By adding a water absorbing substance. How are Tropical Cyclones monitored by IMD? A good network of meteorological observatories (both surface and upper air) is operated by IMD, covering the entire coastline and islands. 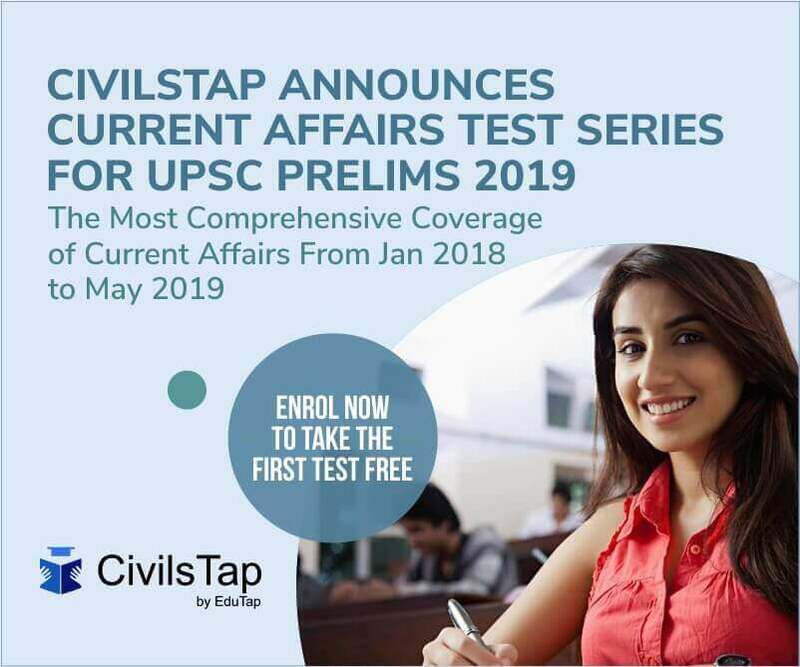 The conventional observations are supplemented by observational data from automatic weather stations (AWS), radar and satellite systems. INSAT imagery obtained at hourly intervals during cyclone situations has proved to be immensely useful in monitoring the development and movement of cyclones.